Is it me, or does it look like Bargnani and KG are waltzing in the GIF? For Friday, I think the Jazz starters deserve special recognition for getting 5 few rebounds than LaMarcus Aldridge. So this site is dead... again? Goodbye Bawful. I wish I had found you earlier. You provide a great deal of entertainment while you where around. I'd love to hear an update about how you're doing these days. I know you don't have plans to start the website back up, but some closure would be nice. hedo is signing with clippers. time to wake up. Garnett- I give up, this site is dead. Nets set an NBA record last night. They were the most efficient team ever in conserving energy when a rebound was up for grabs. Yeah. They got 17 in the game. Screw it ..Been making fun of Mike Brown. firemikebrownagain.blogspot.com. It's raw,but it's awful. Wow, this blog is dead. 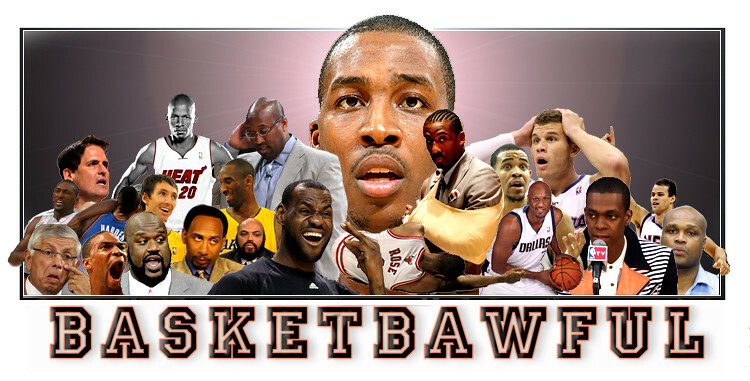 It was the best basketball blog for a long time when Matt was running it. Sad to see. RIP Bawful. This is (b)awful. But thanks for the fish! What happened! I miss your posts! I hope all is well with you Mr. Bawful. Come back soon. Grantland referenced Stephen F. Austin's quintuplet of new trillionaires and I thought of this blog again. I miss it a little. Thanks for the memories. Sad that this blog isn't going on anymore. I just found it and this post is so funny! Hopefully it will start up again. IF it doesn't and you're looking for a new one, check out my website, www.hightopsandhoops.com. We are just starting a blog and have some great deals on basketball shoes. Thanks! - faithful companion over years of bawfulness. The college days with Big Dog; the infamous Gatorade conspiracy that first got me to this site - good times that won't be forgotten! Thanks for all you good souls! Plumblee block on James...come on bawful. All good things come to an end. I enjoyed the ride along with countless others. I thank you guys for a job well done. A hilarious job. Hasta siempre y buena fortuna en lo que les depare la vida.